Green roof plants are generally break down by the two main living roof types: extensive and intensive. Intensive green roofs have deep soils making them capable of supporting a wide variety of plants that would normally grow in a given area. But extensive green roofs, the ones with shallow growing medium, need special consideration when selecting the plants to grow on them. According to a recent study by Michigan State University, you should consider these six factors when choosing plants for an extensive roof. If your roof has a fairly steep pitch then it is going to be quite visible to you and your neighbors. Some plants have natural dormant periods when they are not as attractive as when they are green. You have to decide what is acceptable to you in overall appearance throughout the seasons and choose plants that will achieve the level of attractiveness you want. Here’s where you consider how you will use the roof and what overall objective you have. If you want to access the roof for more than just maintenance you may choose plants that have attractive aromas or that do not attract as many insects as others. Think about other uses for the roof like storm water management, insulation and their fit with your other xeriscape efforts. The environment includes your climate and your microclimate. 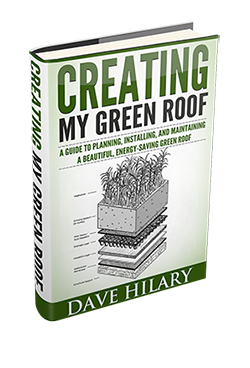 Your average temperatures, including the extreme highs and lows, sunlight, wind, and precipitation determine what plants will thrive on your green roof. How the precipitation is distributed is also an important factor. If you have long periods of dry weather then the plants you choose will have to be especially drought tolerant. Your roof is a microclimate in itself because of its slope, the point on the compass it faces and how it is affected by the surrounding structures and trees. When faced with a choice between aesthetics or plants that have the best chance of survival, go with survival. The composition of the growing media and its depth determine the kinds of plants you can install. Ideally, your growing media should be light, well drained, be able to hold water and nutrients, and not readily break down. In one regard the shallow media of an extensive roof is limiting in the species it can support because it dries out quickly and does not offer room for plants with deep roots. On the other hand the shallow media creates a barrier to undesirable weeds with deep roots. There are many ways you can install plants on an extensive green roof. You can grow them at ground level using plugs. You can also get them from manufacturers already started on a mat or tray. In both of these cases you install them on the roof when they have reached the desired maturity. You can also plant them directly on the roof as plugs, or grow them directly from seed on the roof. Some plant species may not be available in plugs, and when using mats or trays the manufacturer may not include certain species you may have in mind, or that will work best in your region. All green roofs require some maintenance and the types of plants you use will affect that to a certain degree. If you use a mixture of medium water users with light water users you may find you will need to irrigate parts of the roof at different times of the year. Group plants according to their water and maintenance needs when laying out the roof design. Image courtesy of Flickr user Seuss under a CC license.